After the '83 came an '85 GT, but a couple years later, Jim evidently fell and hit his head because he traded the GT for a new Bronco. After recovering from the concussion (in roughly six weeks), he traded the Bronco for a new '88 GT. "I was unaware that my wife-to-be, Laura, really liked the Bronco," Jim says. But, at that point, the wedding was just a few weeks away. In other words, Laura was in too deep to back out. She apparently was able to overlook the trade because the two remain together. But Jim sold the GT after just a couple years as he stepped out of the game. In the spring of 1998, Jim came out of Mustang retirement in a big way with a '97 Cobra that had just 4,000 miles on it. Of course, the Cobra spent quite a bit of time at the track during Jim's first year of ownership. He soon became serious and began racing the car in modular classes. 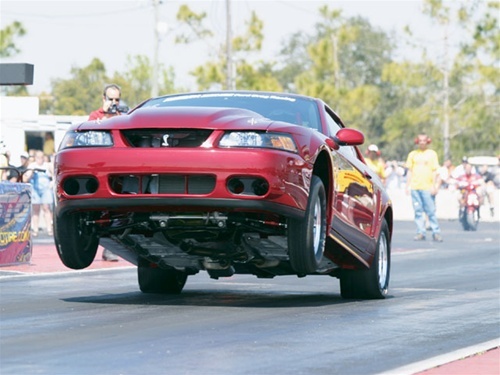 Those who've followed Mustang racing the last few years know that Jim won the NMRA's Modular Muscle class in both 2000 and 2002 with the Cobra. The car received regular upgrades at Paul's High Performance in Jackson, Michigan, and by the end of the '03 season it ran high 11s naturally aspirated. That Cobra is now for sale, because the Mustang you see here is Jim's latest mount. There were a few reasons this '04 Cobra came to be. First was that the NMRA's Real Street class really piqued Jim's interest. Second, it's a power-adder class, and Jim had never run a power-adder car before. Another factor was that Jim wanted to garner some attention for modulars, and he thought the best way to do that was by running in a heads-up class. Furthermore, the class was getting faster and faster. "If I was gonna do it, I needed to get in pretty quick before it got too fast for me," Jim says. Jim must've been paying attention at the '03 NMRA World Finals at Bowling Green, Kentucky. There, MV Performance co-owner Tim Matherly ripped off a 10.14, a veritable warning shot over the bow of the Real Street class. Tim basically blew up his junk on that run, but the message was there, and Jim caught it, because in December of 2003, Jim inquired about purchasing Tim's car. Tim declined the offer, but he did say he could have a car for Jim ready to go to the paint shop in six weeks. Whatever route he chose, Jim wanted to begin the season at the Bradenton NMRA opener. So, when he heard Tim's offer, negotiations began in earnest, and in January 2004 construction began on Jim's own NMRA Real Street ride. Tim procured a body-in-white from Mustang Parts Specialties (located in Winder, Georgia, just down the road from MV Performance's Statham, Georgia, site. Tim's MV Performance partner, Kainnon Vilminot, went right to work by welding in a chrome-moly cage, through-the-floor subframe connectors, and assorted other chassis-stiffening components. Once Kainnon was done, the body went to Jason Karnes of Karnes Customs for the House of Kolor Kandy Brandywine paint, with the underside of the car treated to a white pearl having a touch of the Brandywine as well. Tim sent periodic progress photos of the car to Jim, but as it came closer to completion, the photos became more vague. Tim wanted to keep Jim in suspense and not give anything away before it was time. Once the car received paint, it went back to MV for the suspension, the drivetrain, and the interior. Tim gave Jim a date to come and pick up the car, and Tim and the MV crew worked their butts off to have everything done on time. While driving through West Virginia to pick up the car, Jim received a call from Tim at midnight just to see how his trip was going. It was snowing at the time, but Jim appreciated that kind of service from Tim. He also appreciated the work that went in getting the car done on time. So what was Jim's first reaction when he saw the car? "It was exactly what I wanted," Jim says. Tim had said the car was nice, but Jim hadn't seen photos of the car's exterior, so he had no idea what it looked like. Jim said even the color was exactly what he had in mind. Now that Jim has made a few passes in the car, he says there's a definite increase in power over his Cobra. "Things come a lot quicker in this car. Of course, pulling the wheels 2-3 feet in the air the first race of the year put an ear-to-ear smile on my face." One of the biggest things that Jim recalls is that the car had zero test passes on it, and for it to pull the wheels and go straight down the track the way it did was amazing to him. "I think Tim and the MV crew know a thing or two about building race cars," he says. While Jim admits he has had to catch up with the car's performance right off the bat, he calmly says nines won't be far off.